I am a bit off schedule on pretty much everything. My oldest son was sick for the past three days and the back burner everything went. So I am posting this rather later than usual. 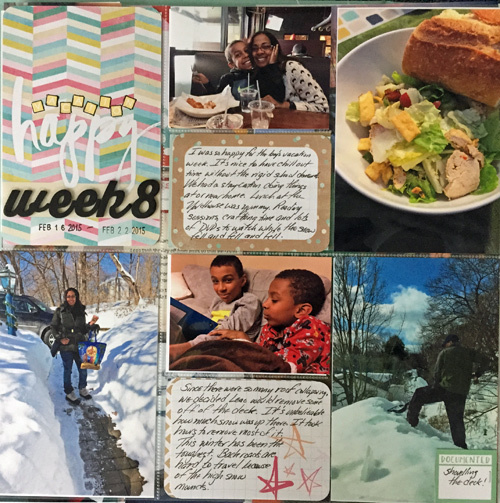 Week eight was a fun week but also very stressful with the sheer volume of snow we had. Never before had I thought about our roof and trees during the winter months before this winter. Every time I watched the news I would see another roof collapsing and trees come down. I think our roof is pitched enough that we didn’t have to worry so much but our deck is covered and the pitch isn’t as steep. Leao bought a long tool to pull some of the snow off of the roof and then he took out our ladder and climbed up (yes, in hindsight, it was dangerous and we probably should not of done it). I watched him shovel off our deck from the boys’ bedroom window. It was insane. Looking at the photos it doesn’t look like he is shoveling a roof! To escape the house we took the boys to The Yardhouse to eat on one day. What can I say about that but pure yumminess!! The crazy thing is that I had Leao take the picture of me on our walkway to show how high the snow was, well it got much higher. At it’s peak, it made me feel like we where walking through a snow tunnel to get to the cars and I am pretty sure the neighbors could barely see us come and go. I love capturing our reading sessions on my camera. It’s so important to me and I hope they look back and remember the times with fondness. Last year, in addition reading my books I started listening to audiobooks. I just love it. So I decided to take a picture of me walking around with my iPhone listening to my audio books. It’s something I do when I work and sometimes when I cook. On our way to visit my in-laws we saw all sorts of warning signs up on the highway so I snapped a picture of that. My niece’s that lives in Florida celebrated her birthday this week and my sister-in-law sent me this beautiful photo of her. Wow, I remember her in diapers and now 13!! What a beautiful and intelligent young girl she has become. Still Fan Girling Sujata Massey. So when I received an email from her, I still did my little happy dance. Perhaps this year, I will get to meet he in person. Love her books. Well that is all for this week. I will be back next week with week nine! Hi Belinda! 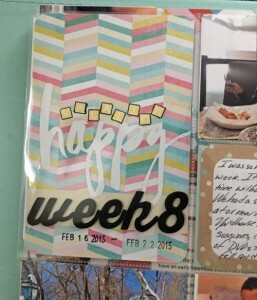 I love the way you capture life weekly in a scrapbook (?). I’m older and when my kids were little we took pictures. My day was photo albums and my pictures did not go in photo albums, no they are in boxes! I love your pages and writings along with the photos. What a beautiful way to really make more memories than what is in our minds, lol! Hope the weather gives you a break. Out here in Northern California we have been having beautiful weather and Winter passed us by. I love the great weather but without the snow and rain we will have a horrid fire season. Any more snow will make your walkway into a tunnel. It’s amazing how high it can get. Hope your son is all better and the back burner is getting cleaned up a little. Hugs and thoughts of sunshine to you! Rasz, any time I get a visit from you on my blog, is always a sweet blessing, You are my ray of sunshine! Which is really needed here. Thank you for always taking the time to read my words and find something to say to put a smile on my face. I read your comment yesterday on my iPhone and thought, I need to reply to her sweet message on my computer not this little device that always leaves behind a trail of typos! 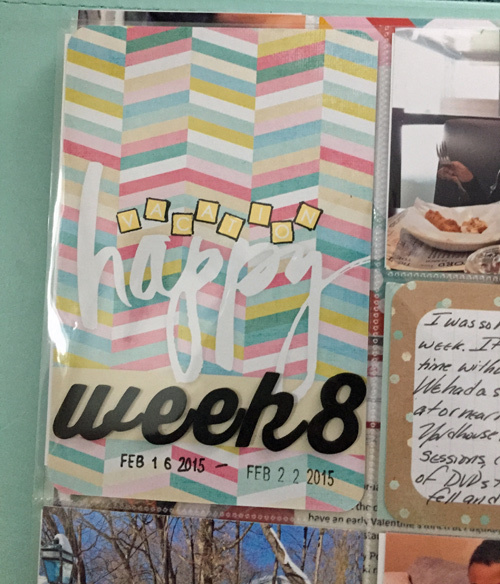 I used to do traditional scrapbooking in albums with layouts now I really enjoy pocket scrapbooking where I can tuck photos in pockets and journal a bit. It takes much less time and I find I can stick with it better. I say, I can leave them behind for my kids because I don’t think I can part from them while on this earth! I like looking through the daily happenings. Don’t discount photo boxes. 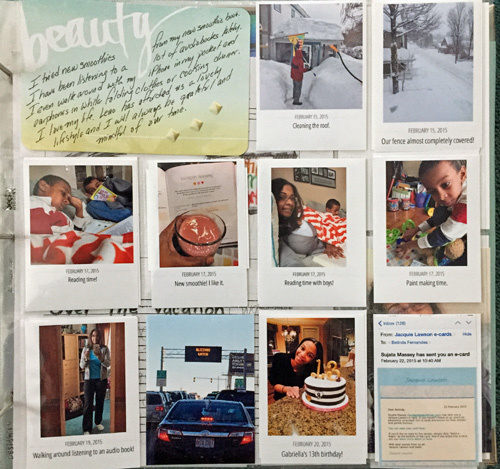 You are still fortunate to have captured your life with your kids no matter what format you store them. I cherish all the photos I have from my mom. My oldest, is slowly recovering. It seems to be something viral that takes time. Today finally was a turning point in his appetite. So I will take each blessing as they come. As for my back burner, girlfriend, it’s full with projects, custom projects and all the ideas that are spilling forth. But I am slowly tackling them now that Nicholas is feeling better. The weather is even improving. We might reach the 60s by Friday. I know that’s cold for California but for us right now, that’s pretty much paradise. Thank you dear friend for the visit. I hope you are having a blessed day.